Houghton Mifflin Harcourt, 9780544464049, 320pp. 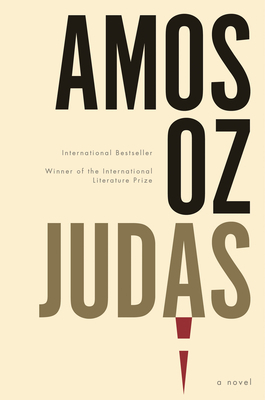 At once an exquisite love story and coming-of-age novel, an allegory for the state of Israel and for the biblical tale from which it draws its title, Judas is Amos Oz's most powerful novel in decades. NICHOLAS DE LANGE is a professor at the University of Cambridge and a renowned translator. He has translated Amos Oz’s work since the 1960s. "In this novel of nineteen-sixties Jerusalem, Shmuel Ash, lovelorn graduate student and lukewarm socialist, abandons his thesis ('Jewish Views of Jesus') to care for a frail, elderly Zionist living in a funeral villa. There he meets a cynical beauty who lost both her father and husband in the mid-century wars, backroom and battlefield, that defined the contours of Israeli statehood. The novel has a clear message; as Shmuel says, 'All the power in the world cannot transform someone who hates you into someone who likes you.' But Oz tempers this didactic edge by making Shmuel a hapless figure—with walking stick, inhalers, and baby-powdered beard—unimpressive to the aristocratic recluses he's stumbled among. "—The New Yorker, "Briefly Noted"
"Like Oz's nonfiction "A Tale of Love and Darkness," "Judas" grapples with big, historical matters for which there are no simple answers: the founding of Israel and the founding of Christianity. Both remain rich subjects to explore today."—St. Louis Post-Dispatch, "Best Books of 2016"